Does the plugin support payment methods different from the WooCommerce standard ones? The plugin supports all the payment methods implemented as required by WooCommerce. 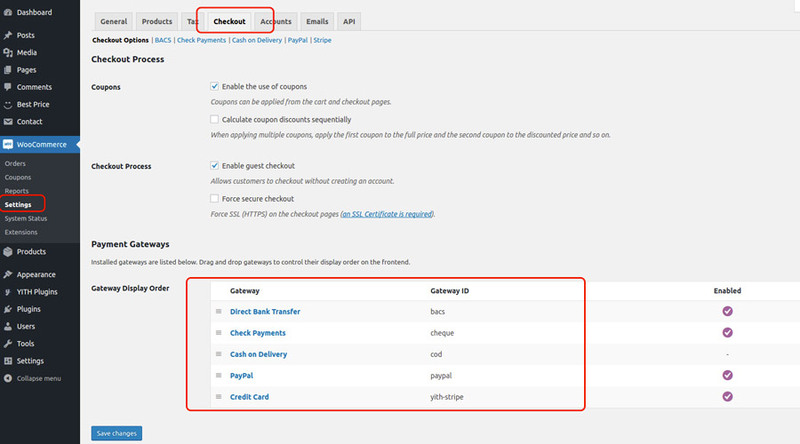 You can set all the payment methods available in the list in WooCommerce -> Settings -> Checkout with the payment rules configured with the plugin. Lastly, you can configure payment rules also for additional payment methods such as Stripe or Authorize.net. Can I apply more than one rule to the same payment method? Yes, the plugin provides this possibility. You can apply an unlimited number of rules to the same payment method: the final cart total will be given by the amount of the discounts and /or decreases configured for the rules.